Deferoxamine (also known as desferrioxamine B, desferoxamine B, DFO-B, DFOA, DFB or desferal) is a bacterial siderophore produced by the Actinobacteria Streptomyces pilosus. It has medical applications as a chelating agent used to remove excess iron from the body. The mesylate salt of DFO-B is commercially available. Deferoxamine is used to treat acute iron poisoning, especially in small children. This agent is also frequently used to treat hemochromatosis, a disease of iron accumulation that can be either genetic or acquired. Acquired hemochromatosis is common in patients with certain types of chronic anemia (e.g. thalassemia and myelodysplastic syndrome) who require many blood transfusions, which can greatly increase the amount of iron in the body. Administration for chronic conditions is generally accomplished by subcutaneous injection over a period of 8–12 hours each day. Administration of deferoxamine after acute intoxication may color the urine a pinkish red, a phenomenon termed "vin rosé urine". Apart from iron toxicity, deferoxamine can be used to treat aluminium toxicity (an excess of aluminium in the body) in select patients. In America, the drug is not FDA-approved for this use. 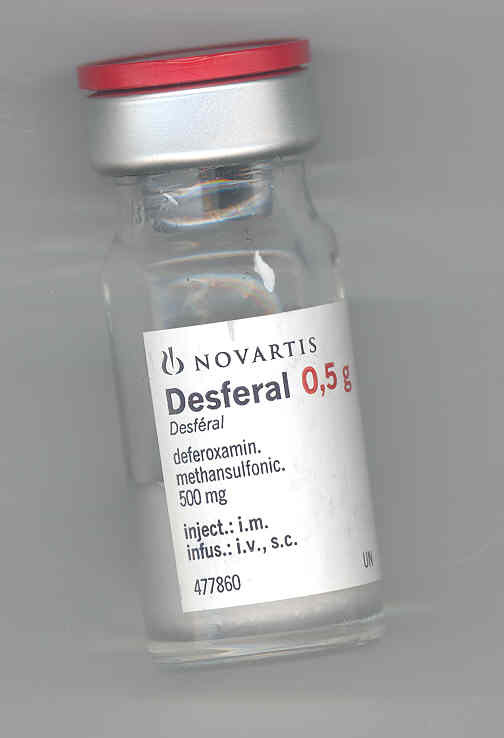 Deferoxamine is also used to minimize doxorubicin's cardiotoxic side effects and in the treatment of a patient with aceruloplasminemia. Deferoxamine acts by binding free iron in the bloodstream and enhancing its elimination in the urine. By removing excess iron, the agent reduces the damage done to various organs and tissues, such as the liver. Also, it speeds healing of nerve damage (and minimizes the extent of recent nerve trauma). Deferoxamine may modulate expression and release of inflammatory mediators by specific cell types. Deferoxamine is being studied as a treatment for spinal cord injury.